On the comfort food index, chicken noodle soup is right up there. It’s like a warm grandma hug in a bowl. The old-fashioned chicken noodle soup I grew up on was a culinary big deal. It involved a whole plump farm chicken (normally the noisiest cockerel) and lots of time. On rushed winter weeknights I want all the soul-warming pleasure of this childhood favourite – but I want it in under 30 minutes. The solution? Go Asian. 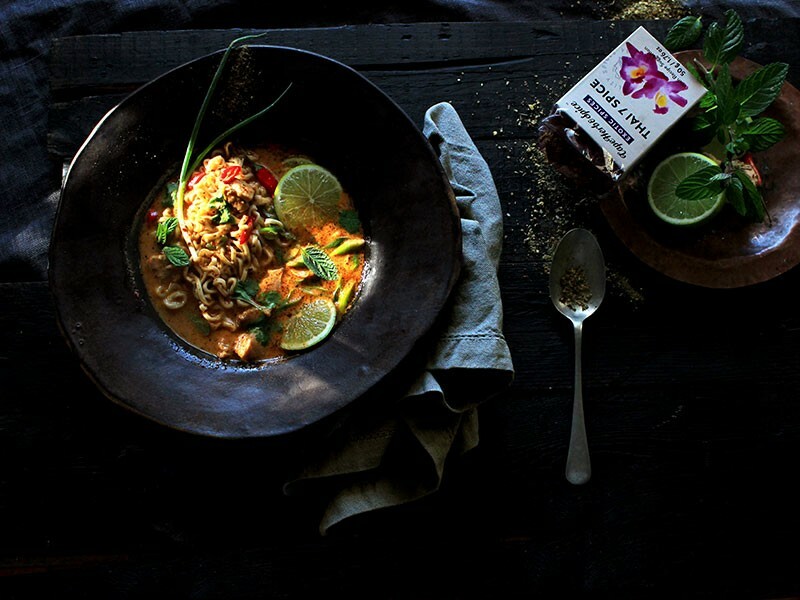 Cape Herb and Spice’s Thai 7 Spice blend contains no fewer than – you guessed it – seven of the key spices we associate with Thai food. 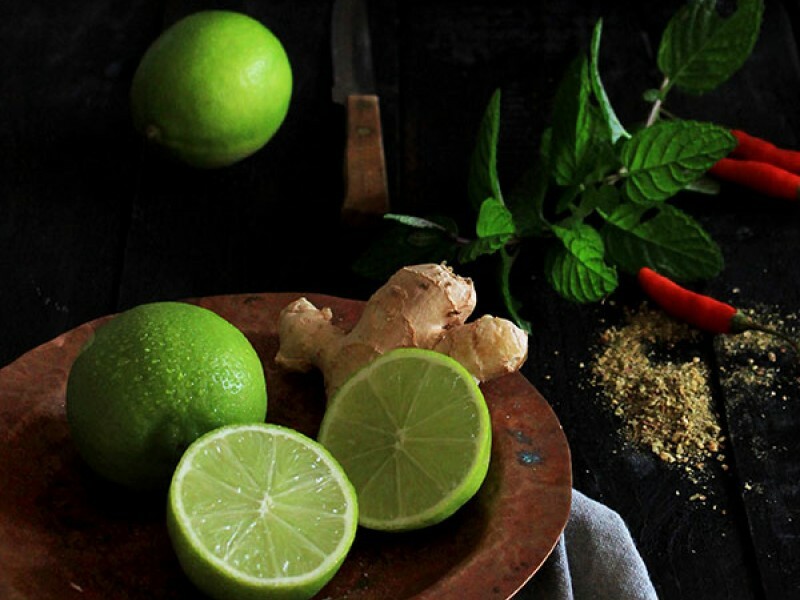 Perfumed basil, ginger and coriander make an appearance, so too does punchy peppery galangal and spicy chilli, plus of course zesty lime leaves and lemon grass. Combine it with coconut milk, diced chicken and noodles for a satisfying dinner that’s ready in no time at all. Slice the chicken into strips or blocks. Heat a large saucepan and add the coconut oil. Fry the chicken in the coconut oil for a minute or two just until it starts to colour, then add the tomato paste and Thai 7 Spice and stir-fry for a further minute. 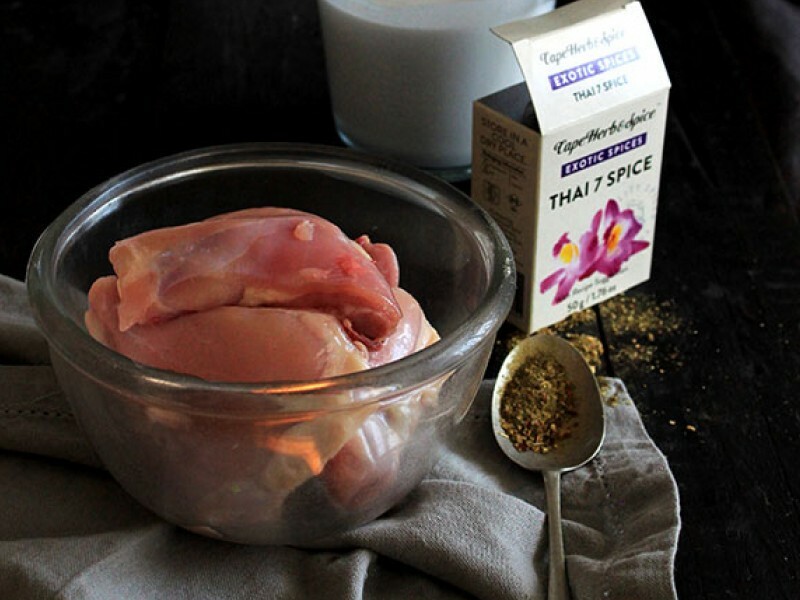 Add the chicken stock, coconut milk, ginger slices, sugar and Thai fish sauce. Put on the lid and cook for 10-15 minutes. 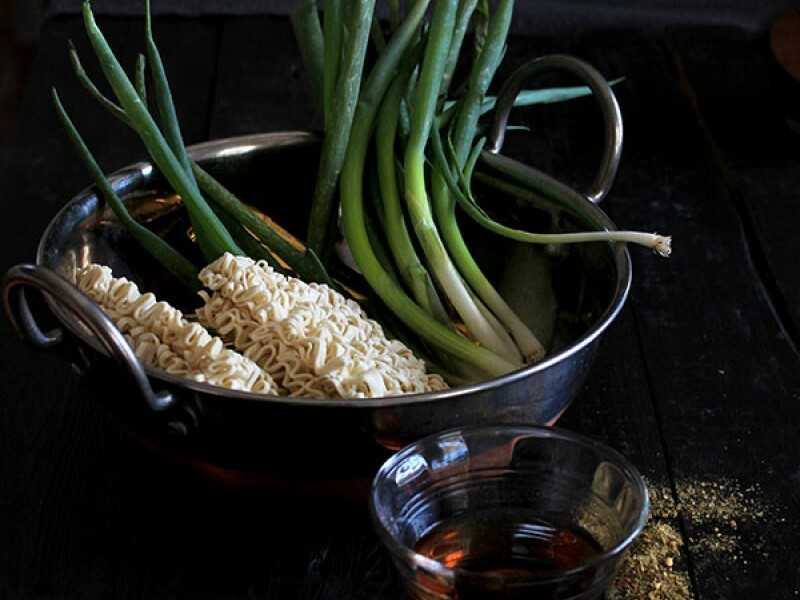 Place the noodles in a bowl, pour over boiling water to cover and microwave it for a minute or two until the noodles are just cooked. Watch out for it going mushy, it happens real fast. Drain noodles in a colander. Remove the soup from the heat and add the lime juice along with the coriander. Stir and taste to see if it needs salt. If so, add soya sauce to taste. Place a generous mound of noodles in each bowl and spoon over the soup. This soup really comes to life thanks to the extra titbits you dress it with! So serve this soup sprinkled very generously with sliced spring onions, mint and basil leaves, plus sliced red chilli if you like it extra spicy. If I manage to lay my hands on it, I also like topping this with some bean sprouts for an added crunchy element. Chopped roasted peanuts are another crunchy option. This recipe will serve four as a starter, two as a generous main.